Osteoarthritis (OA), sometimes referred to as degenerative joint disease, is the most common form of arthritis. If you are suffering from pain associated with OA, you are not alone. OA affects nearly 27 million Americans1, and it is projected to affect nearly 67 million by the year 2030.2 Physical therapy reduces arthritis pain by helping to correct abnormal movement patterns, increasing mobility, and reducing wear on joint tissues. It’s important to understand that pain does not correlate well with the evidence of OA you may see on x-ray. Studies on people who have no pain at all have demonstrated x-rays or MRI showing arthritic changes. Each individual’s situation is unique. Forces from sustained postures and repeated movements, lifestyle factors, selected activities, and medical history, are just some of the biomechanical factors that determine if a person has pain or not. In this article we will discuss OA and how we treat it here in the clinic, as well as examine some of the research that shows a high level of effectiveness of manual physical therapy in relieving pain from OA. OA is a condition that is associated with the breakdown of cartilage in joints, and it can affect any joint in the body. While it’s most common in those over age 65, it can be seen in people as young as 25 and usually starts to slowly develop in the body around age 40. The main role of cartilage is to protect the end of your bones and allow for smooth, easy movement in the joints. As you age, and put more “wear and tear” on your joints, the cartilage slowly begins to breakdown and become rough. This causes bones to rub against one another, causing pain, stiffness, and reduced movement in the joint. In our clinic we focus on correcting the abnormal biomechanics and mechanical forces that result in more wear and tear on your joints. Each person comes to the clinic with their own unique situation, their own unique condition. This is why treatment is highly individualized based on the patient’s specific needs. Movement is important in maintaining healthy tissues, especially in people with OA. The right activity is key – some may irritate the condition, while others provide therapeutic benefits. 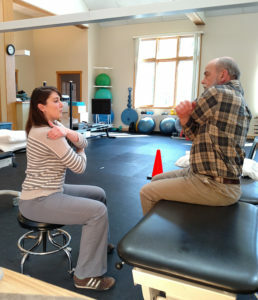 We work one-on-one with our patients to develop a routine that is right for them and their condition. When intervention is early enough, and abnormal movement patterns are corrected, you get the opportunity to prevent further damage to tissues, prolonging deterioration of the condition. Surgical procedures, including total joint replacement, have improved substantially over the years. The invasiveness and recovery from total joint surgery is appreciatively less than it was 20 years ago. However, it is still a major surgery. Many people must deal with maladapted movement patterns that they developed in the years leading up to their surgery. As our body compensates for pain in one area of the body, it can cause imbalance as more strain is put on other areas in compensation. This causes altered movement patterns that need to be addressed through manual therapy and retraining of proper biomechanics. Early intervention is an effective way to prevent or reduce further wear from OA. Correcting the abnormal biomechanics, decreasing excessive forces on the joints, and learning the movement patterns that are best for you will help to decrease pain and increase range of motion. Over time, with this knowledge, you will continue to promote a healthy tissue environment and help prevent premature wear of the joint. 1. Lawrence, R., Felson, D., Helmick, C. et all. Estimates of the Prevalence of Arthritis and Other Rheumatic Conditions in the United States, Part II. Arthritis & Rheumatism 58(1), 26-35. 2008. 2. Andersson, G., The Burden of Musculoskeletal Diseases in the United States: Prevalence, Societal and Economic Cost. American Academy of Orthopaedic Surgeons. 2008. 3. Dayle, G., et all. Effectiveness of Manual Physical Therapy and Exercise in Osteoarthritis of the Knee. Annals of Internal Medicine 132(3). February 1, 2000. 4. Kirkley, A., et all. A Randomized Trial of Arthroscopic Surgery for Osteoarthritis of the Knee. New England Journal of Medicine 359, 1097-1107. September 11, 2008.